We are excited to announce that the 2019 HORIZONS K8 yearbook is now on sale. Make sure that your student doesn’t miss out on our yearbook tradition. It’s the only book that captures the year’s events, activities, friendships, experiences and memories from Horizons. The book is on sale until November 2nd for the lowest price. 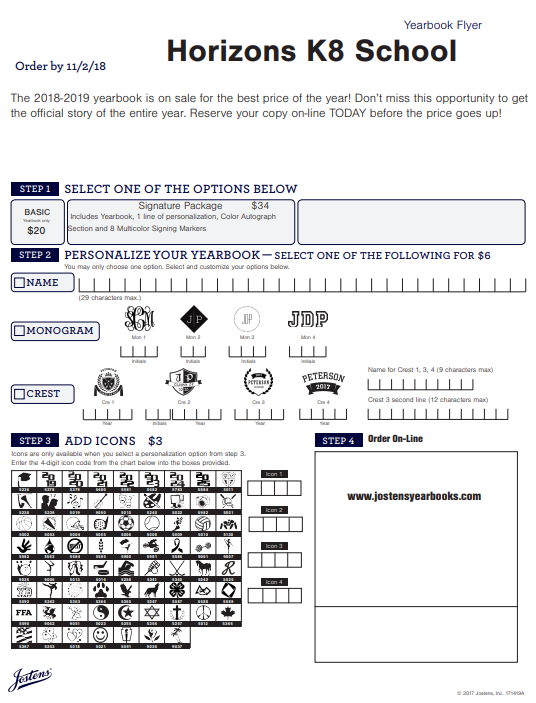 You may place your order for the yearbook at www.jostensyearbooks.com. If you have already purchased a book, thank you! This year’s book is one you won’t want to miss! Also, note there is a place to donate $ for books to those whose finances might prohibit them from purchasing. Please consider this! Thank you!